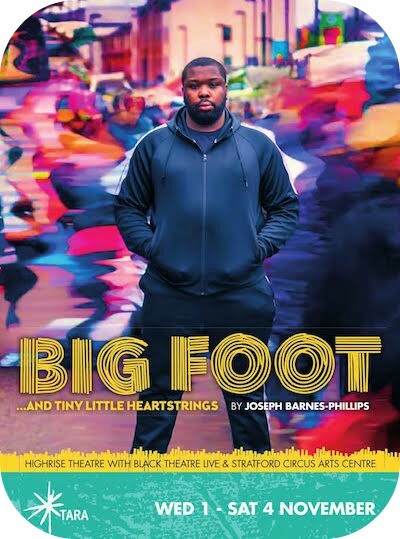 Guyanese folk stories, grime and anime references; Joseph Barnes-Phillips’ Big Foot pulls on a multitude of references to build a diverse show that excites, moves and challenges it’s audience. 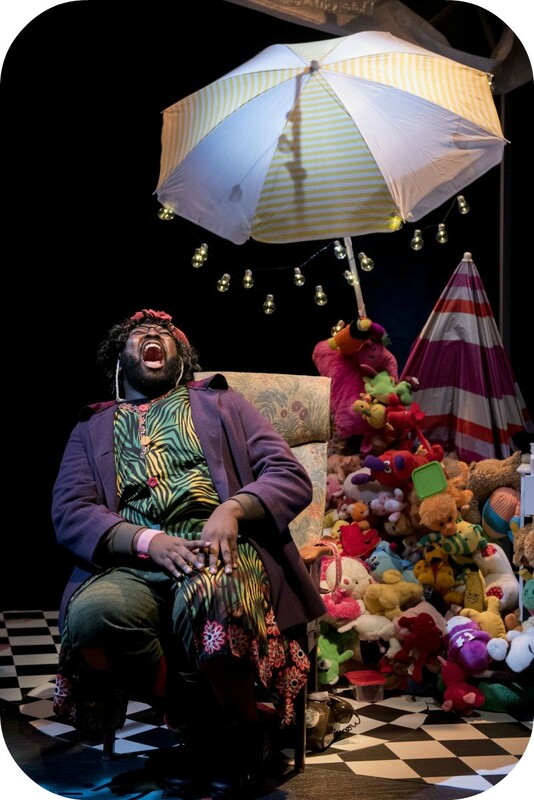 Directed by Dominic Garfield, this show is rarely still – constantly moving locations, introducing new characters and exploring different ways of story telling. The brilliantly inflated character of Rayleigh’s mother, Moon Gazer, welcomes in the audience. Rowdy chit chat about relationships, Moon Gazer charmingly protests about ‘sewing seeds before putting a ring on it’. Infecting the audience with laughter, they are connected into this production from the very beginning. 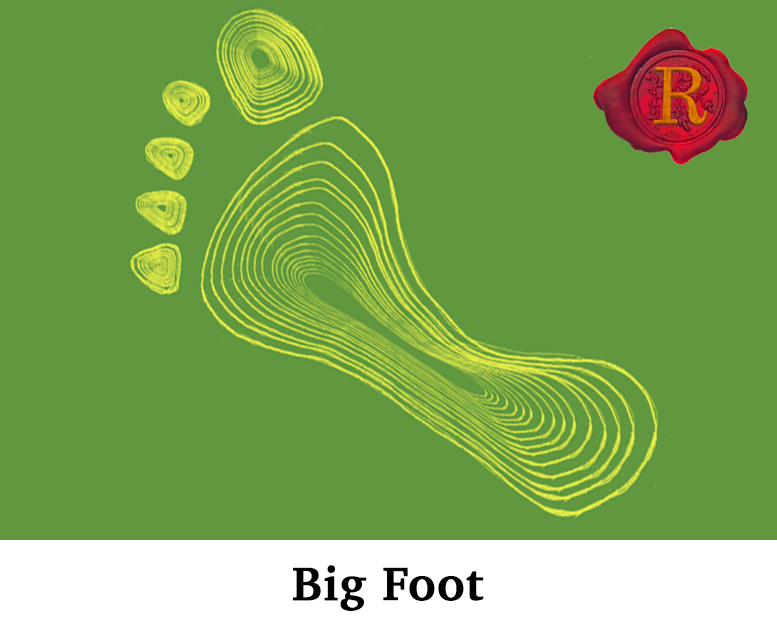 A stage crowded with soft toys, and childhood gadgets; Big Foot is jam-packed with imagination. 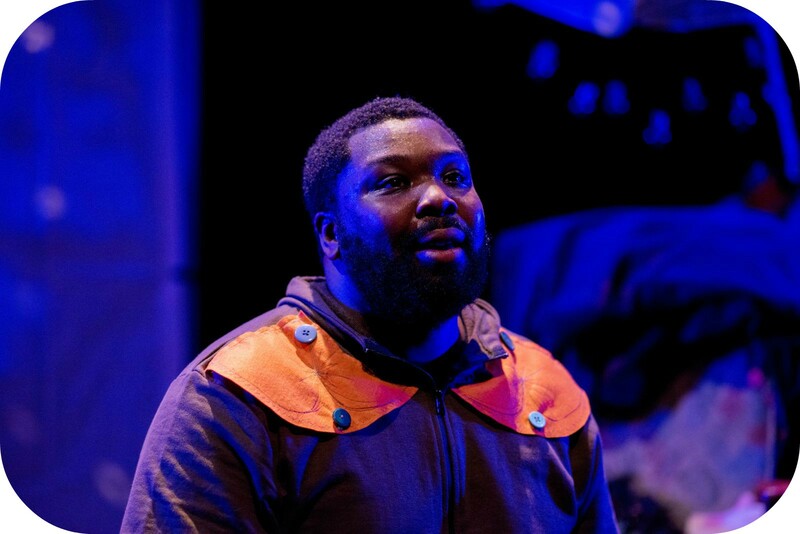 Calling ‘Spice Girl’ on his Vtech, multi-coloured mobile phone and getting up into rude boys grills with a plastic water pistol – Barnes-Phillips is clearly portraying the vulnerability of young Rayleigh and explores how his childhood will go on to effect him as a man. Joseph Barnes-Phillips has imagined three definitive characters, Mother ‘Moon Gazer’, Girfriend ‘Spice Girl’ and ‘Rayleigh’. Screaming with attitude and sass, ‘Spice Girl’ is constantly wiggling her hips and teasing Rayleigh. Moon Gazer is larger than life, full of energy and charisma, immediately recognisable as a single mother whose son lies at the core of her existence. Barnes-Phillips has based this one man show on his own life, using people and situations he has experienced to form Rayleigh’s world. Incredibly poignant is the letter which he asks the audience to read at the end, a real letter from his father to his mother after he left her pregnant. This brave decision to use his own personal material for the production is an insight to how important it is for Barnes-Phillips to share his story and work with young men to change their futures for the better. Wonderfully entertaining, Joseph Barnes-Phillips delivers an important message through his colossal performance. Copyright © 2019 Scatter of Opinion. Powered by WordPress and ThemeGrill.